…and it includes a wondrous activity kit! Who doesn’t love a wondrous activity kit? Okay, boys and girls, it’s time to start thinking about stocking stuffers and what better with which to stuff a stocking than chocolate?? 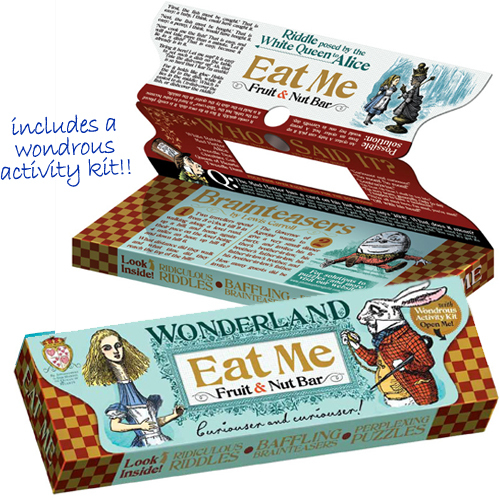 Check out this fabulously quirkly and delicious Alice in Wonderland Eat Me Fruit and Nut Bar! Find this and other fun things to stuff at 10% off with code HOHOHO! Find some other fun things for stuffing into stockings in our Fun Finds section as well as our Gifts Under $50 section! Great Jen, now I want chocolate.